I enjoy a good history book, and this one was on sale at Audible -and trending hard, so said the site. I am already familiar with the Genghis Khan story. Dan Carlin's "Wrath of the Khans" podcast series was better. How did an illiterate boy from a poor shunned family eventually conquer the known the world? And what were the effects of his rule? Sounds like a great story. That's what I bought the book. I won't go in to much detail about the content of the book. If you would like to learn what is inside the book, feel free to read the Wikipedia. Boom. You now know. How did Genghis Khan keep the troops on task when everybody was illiterate? Why were the Steppe warriors so effective? What was his style of rule? The book overall was interesting read. However, I do not feel like I learned any more than I already knew. 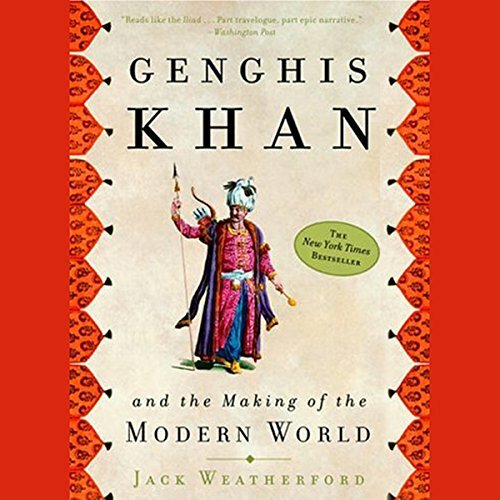 If you are brand new to Genghis Khan, I think you would enjoy this book a lot more. The part I was looking forward to the most was the "and the Making of the Modern World" portion of the book. For example, how did the world change thanks to his conquests and rule? Sadly, not much time was spent there. The stories stop after a few generations, and there is little mention of the trajectory of a nation before being conquered. Discuss Genghis Khan and the Making of the Modern World in the forums.